I’m so genuinely caring that people often take my genuine interest in their thoughts as sarcasm or mocking. I’m loyal to those who are loyal to me and often to those who aren’t. I think everyone will get his or hers in the end. I’m somewhat of a wanderer -- in thought and physical location. I’m not a “think-before-you-speak” kinda guy. I have no respect for a disrespectful person. I consider myself to be virtually fearless, and although I acknowledge consequence, I don’t empower it – “Our doubts are traitors and make us lose the good we often might win, by fearing to attempt.” Every man should pave his own path, establish his own beliefs and take full advantage of his right to the pursuit of happiness! “Question with boldness even the existence of a God; because, if there be one, he must more approve of the homage of reason, than that of blind-folded fear.” I’m a hopeless romantic, believe in love and soul mates and want a woman who sees right through me and loves what she finds! I have the tightest knit group of friends and greatest family a man could ask for and would lay down my life for every one of them! Procrastination is wasting today’s time to clutter up tomorrow’s opportunities with yesterday’s troubles. 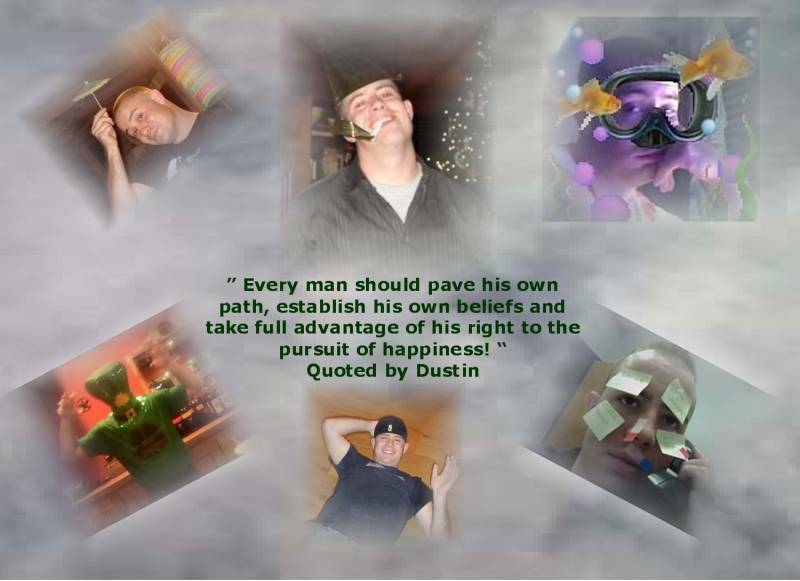 I know Dustin was making some changes as you can read moving out on his own and wanting a dog LOL I read this and I think God was preparing us all for the plan he had for Dustin. That he would be moving by himself into a place we all can just imagine. I e-mailed Tiff about Paul. That's crazy! I know his job is dangerous though. Any new word on the groundbreakin' event?!? I'm not gonna move out there. The more I thought about it, it's too far from Houston for me. And, I think I'm gonna actually move further into Houston by myself. I'm gettin' a lil burned out on the roommate deal. How are all the new babies doin'? I wish I had enough time to have a dog. I want a medium sized dog, but 6 weeks away from it will make it forget me, I think. What do you think? I'm soooo ready to get outta here. 4 more days...woo-hoo!! Did I tell you the restaurant is closing down? Friday is its last day open. I'm gonna go eat there when I get back in town and say goodbye! It's sad to me. I worked there a long time and they gave me lots of opportunities to learn. Oh well, such is life. I love you and miss you. I e-mailed Uncle Hungry, but he never replied. Is he OK? You can e-mail here, but no forwards and you have to put my name in the subject line. 4. What is your favorite TV show? I agree w/ Tiff, I love Grey's Anatomy...I mean UFC? 8. What food do you like? Every food! 9. What is your favorite CD at the moment? Does my I-Pod's "Gospel" playlist count? 18. What was your most recent memorable birthday? 18...is that still considered recent? 23. Favorite saying? That's deep. 25. Are you a morning person or a night person? Can I be an afternoon person? 38. How is the weather right now? I wouldn't know because I'm stuck in this stupid office w/ no window!!!!!!!! 40. Do you like the person who sent this to you? Of course! 47. Summer or winter? Summer all the way!! !